Claus Pedersen (Asbæk) is the commander of a Danish military unit, stationed in Afghanistan to combat the Taliban. Meanwhile, back in Denmark, his wife Maria (Novotny) battles with parenthood, caring for her three children alone. Claus’s actions in the warzone take a greater toll on his family when a routine mission goes very wrong and innocents lose their lives – his leadership is questioned and he is forced to stand trial. 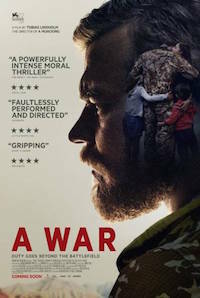 With rich characters and a riveting plot, A War is a refreshing combination of frontline thriller and courtroom drama. Starts at 7:30PM Click on time to book relevant tickets.